Our staff has been trained to answer many of your questions and help schedule an appointment from a self – referral or physician referral. If you feel your problem is an emergency, please indicate this when calling so we can handle your situation accordingly. For non- emergency situations, we can usually schedule a new patient to be seen within a few days. When scheduling your first visit, time will be allowed for completing paperwork necessary for treatment and filing of claims with your insurance carrier. This will include a medical questionnaire, necessary personal data and insurance information. As with all clinical practices, we will make copies of your insurance card & driver's license at your first visit. If you are using insurance as means for payment, there are a number of forms that need completed so that we can process your claim. To prepare for your visit, you can complete several of the forms ahead of the time. These forms are available for download at “Documents”. Part of your exam will be a review of the medical information with Dr. Stein. 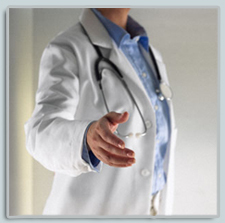 Dr. Stein will discuss your medical history and then perform a comprehensive physical examination, after which he will discuss with you his impressions and recommendations. Any necessary procedures will be discussed, questions answered, and scheduling done.